Yesterday, Elliotte Friedman mentioned that the Rangers and Calgary have been talking about a potential Mats Zuccarello trade. This shouldn’t surprise many people, as Calgary has a comfortable six point lead on the Pacific Division, with a three point lead on Winnipeg for the top seed in the West. Calgary is a surprising team this year. They took a gamble with the Dougie Hamilton deal, acquiring Elias Lindholm (58 points) and Noah Hanifin (25 points) in the trade. It’s worked out thus far. The Flames are looking to bolster their depth, as outside of Gaudreau-Monahan-Lindholm, the rest of the forward lines look mediocre at best. There are rumors that Calgary wants to dangle Sam Bennett. The former 4th overall pick in 2014 hasn’t cracked the top-six with any consistency and hasn’t cracked 20 goals or 40 points yet. However I don’t think Bennett, a 22-year-old forward who can play all three positions, would be available for a rental. Flames GM Brad Treliving isn’t really known for wheeling and dealing. He took a calculated risk in the Hamilton deal. His last big deal was for Travis Hamonic. So Treliving isn’t one of those GMs that really gets fleeced regularly. Also worth noting that Brian Burke is no longer with Calgary. A few things to keep in mind: Calgary didn’t have last year’s first rounder, and they also don’t have this year’s second rounder. Both went to the Islanders. They also don’t have that great of a farm system (29th in the league, per Corey Pronman). I stand by my assertion that Zuccarello can fetch a 1st round pick and a mid-level prospect (swing and a miss on Colorado as the landing team, though). Calgary has a 1st round pick, and they have mid-level prospects. Now if the Rangers can get Oliver Kylington (not bloody likely) or Juuso Valimaki, then take it and run. But I chalk that up as not happening. Rasmus Andersson is probably off the table too. Andrew Mangiapane is interesting, but Jeff Gorton doesn’t strike me as a guy who is interested in trading for a 5’10”, 185 lb guy who is already 22 years old. He routinely passes on high ceiling, small-ish players, and Mangiapane is one of those players. Dillon Dube (2nd, 2016) might be an option here. He’s a point per game center in the AHL, and the 20-year-old center put up 1-4-5 in 23 games in his first cuppa this season. Matthew Philips (6th, 2016) is even smaller than Mangiapane at 5’7″, but he put up 112 points in his final year in the WHL before going to the AHL (10-16-26 in 40 games). He hasn’t had trouble adjusting, but he needs to get stronger. The skill is there, and if he can get stronger legs, he will win more battles. All this said, I don’t think the Rangers will be picking from this level of prospect for Zuccarello. The next tier of prospects includes Joly D’Artagnan (6th, 2017), and this is the tier I expect the Rangers to pick from. D’Artagnan has the best name ever. Need I say more? I do? Ok then – he’s put up decent numbers on bad QMJHL teams. He’s not at the skill level of Dube or Philips, but he’s overall good with no real glaring weaknesses. Filip Sveningsson (7th, 2017) is the only other prospect at this level, who’s doing well in the J20 Swedish league. He’s a project, but he’s got the complete Swedish game. Nothing elite, but nothing bad. My guess is the Rangers go for either a 1st and a lower tier prospect like D’Artagnan, or a 3rd and a higher level prospect like Dube. They (likely) won’t get both for Zuccarello. That said, crazier things have happened. 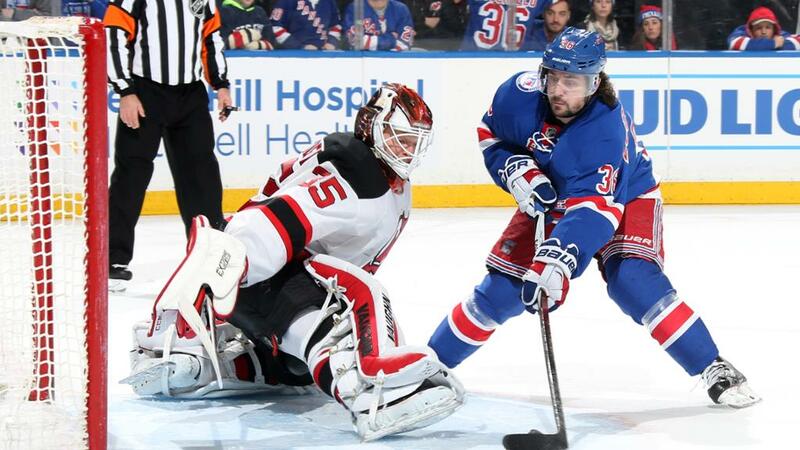 It’s a pure rental deal, and despite his early struggles, Zuccarello is back to being Zuccarello. His hot streak has come at the perfect time. That may irrationally inflate value, because NHL GMs are NHL GMs. I’d expect Zuccarello to be traded before Kevin Hayes, perhaps sooner than we might expect. "Exploring the Zuccarello/Calgary discussion", 4 out of 5 based on 10 ratings. I think there are better options from Carolina or Edm. I think keeping Zuccarello for what is discussed above is the better option. Ny should be asking for 2020 first rounders too. Not the 2019 picks. Hard for me to understand the logic of “these offers are so weak may as well keep him”. His contract expires. Nyr benefit from lack of post deadline production. Part of it is loyalty to a player who has been nothing but a class act, for sure. But that he has been nothing but a class act is part of it, too. There aren’t currently wingers knocking down the NHL door in Hartford, and even the most torn-down of rebuilds feature vets. Who else is better to show a young kid what giving 100% can achieve than Zucc? As long as they don’t overpay him, I have no qualms with the team retaining him. I know sometimes you have to make a business decision, of course – if a first and prospect comes for him, gotta do that. (To disclaim, I don’t think that offer probably comes…that offer seems like it would have been more likely last deadline since it would have been two playoff runs with said team not just one, and they still presumably didn’t get an offer that good.) If Zucc is looking for a reasonable contract at his age and output, I don’t hate it. There are other vets who certainly deserve to be shipped out before him…but, again, I do understand a business decision might need to be made regardless, of course. I don’t think this front office is looking at production. If they were truly trying to tank, it would have been evident by now. Quinn also doesn’t strike me as a guy who wants to lose any games, or who would have left his cherry college gig to come get mopped up in the NHL. I’ve disagreed with him at times, but I think he is doing what he thinks allows this team to become a contender again ASAP. I think we should be trading for top quality, not mid-level prospects. I would prefer Calgary’s 1st and say a 2nd from the 2020 draft instead of a middling prospect. Of course nothing precludes is from packaging Zucc with say a mid-round draft pick or McQuaid to get what we want (assuming of course a team might also be interested in McQuaid). Dube is a quality prospect, skilled and very competitive. He would have to be included in a Zuc package. I was speaking more to Dave’s “litany” of Calgary prospects. Again it needs to NOT be a mid-level/middling prospect — if that’s the case then they need to go the 2020 draft pick route, it will be a good draft. Wherever Zuc lands he will be a difference maker to his new team. Hopefully it will be a club that has a legit chance to win the Stanley Cup. While I hate to see the gifted Hobbit leave, it would be of great satisfaction to see him lift the hockey holy grail over his head. The Calgary 2019 first round pick will be like 26th. I would gamble for a 2020 first rounder and a middle tier prospect. I like the idea of packaging Zuuc and a defenseman for a more 2019/20 ready player. Come on Sal, Who the F wants one of our defenseman? Seriously Sal, I think someone took over your account. Trade two rentals to the same team? Not likely unless the 2nd rental is more of a depth player like say McQuaid. Hayes alone needs to command a top-6 projected prospect, or one hell of a pick. I agree with you on quantity over quality, but Gorton shouldn’t need both of them to get what he should for Hayes alone. Why? we have a top six, I dare say top 3, in Hayes. Why do we trade him for a “prospect”? Why? Please tell me. I would like to see us talk with the Vegas Golden Knights, as they have some pretty good prospects. A guy like Zucc could really help them at the wing and they have a nice group of prospects to choose from. True, but there’s been little chatter re: Vegas and our “rentals”. You forgot that Kreider went off and was replaced by Buch, some of those puck battles, etc. were on Buch. LOL. I realized that as soon as I hit “post” but editing to correct it results in the comment getting delayed for hours. Blashemy! Buch has never won a puck battle in his life! Or at least, that’s what you would think listening to some fans…LOL. I think trading Zucc is just a terrible idea. I wouldn’t trade him or Hayes or Kreider for anything less than a top 15 pick. Our forwards are not awful, it’s the defense that’s completely void of talent. You have to give up talent to get talent (now that Chiarelli’s gone). We need to upgrade our D, so we’ll have to trade away some forward talent to make it happen. If we can land a legitimate top pair defenseman plus a good prospect and a decent draft pick or two for Hayes and Zucc, well, I won’t be happy, but we might have a better team. If we can do better than that, or if either one comes back during the summer, then I’ll be happy, too. That isn’t how trades work though. Eliminating emotion from the situation, Zucc and Hayes need to be dealt and if we want either back, we can pursue them as UFA’s. Keeping them because of sentimental reasons does not help this rebuild. Agreed Supermax, but unfortunately adding the contracts of Skjei, Smith, McQuaid and Shattenpants on the books, on top of Marc Staals deal and Girardis buyout puts the Rangers in cap hell. Saying that, I rather see the team move Names then Hayes as the feisty talented Ruskie is easier to replace. I doubt anyone would take New York’s aging overpaid dmen unless the Rangers accept another bad contract in return. I frankly will not at all in the least bit be shocked if McQuaid is still around next season, at this point. I think they think he is playing well. Pure speculation, but why the hell else was he on the top pair in practice today? He’s not the most talented player, but he is smart, and plays a hard, honest game, which is what you want the kids to learn. The most talented players are not always the best teachers. The guys who have to work hard for everything they get tend to be better. While I won’t disagree that he probably is quite well respected in the locker room, that alone should not warrant his return, nor should it have resulted in his acquisition via trade. I really think Gorton believes that McQ is far more effective than he is. Anyone else recall earlier in the year, the opposing drive where McQ was by himself and outnumbered to be fair, sure…but he just stayed in the middle and coasted backward and neither tried to block the shot/pass nor play the puck? Could you imagine if ADA had done something like that? He would have been demoted to the Maine Mariners. If only he could skate and make 1st pass….. and you don’t keep space only for work hard…. McQuaid is so slow that when he is skating forward one might believe him to be skating backwards. He won’t be anyfleeter next year and he will need to be offered another contract. Cut him loose for picks. Zuc to the Flames makes a lot of sense, to bolster their offense. A first and an ok prospect or a very good prospect and a 2nd will do. Since Calgary has a 1st and not a 2nd, then I guess the former. I can also see Nashville and Winnipeg getting involved as well. I imagine Buffalo is a year or so away from really being a buyer. Still I wonder if there would a trade where the rangers could pry two of Nylander, Samuelsson & Thompson? Could they ever pry two of Valimaki, Dube or Tkachuk from Calgary? Tkachuk would be a great pick up–but it doesn’t make any sense for Calgary. I still think they might be able to entice Winnipeg to part with Vesalainen and Lemieux for a package centered around Hayes.